KING LOUIE AND MOWGLI PRODUCTION CEL WALT DISNEY STUDIOS GOUACHE ON CEL, 1967. Original hand painted production animation cel of King Louie and Mowgli from "The Jungle Book, " 1967, Walt Disney Studios; Set on a lithographic background; Numbered 38 in ink lower right corner; Walt Disney seal lower right corner; Unframed. I Wanna Be Like You! "The Jungle Book, " 1967 was the nineteenth animated feature film produced by Walt Disney Productions and inspired by Rudyard Kipling's book of the same name. The film was directed by Wolfgang Reitherman, it was to be the last film that was worked on by Walt Disney, as he passed away during its production. The film follows Mowgli, a feral child raised in the Indian jungle by wolves, as he encounters Bagheera the panther and Baloo the bear; who try and convince him to leave the jungle before the villainous tiger Shere Khan finds him. Voice actors include: Phil Harris, Sebastian Cabot, George Sanders and Louis Prima; as well as Disney regulars such as Sterling Holloway, J. Pat O'Malley, Verna Felton, and the director's son, Bruce Reitherman, as the voice of Mowgli. "The Jungle Book" was released on October 18, 1967, with noted acclaim for its soundtrack that featured eight original songs: seven by the Sherman Brothers and one by Terry Gilkyson. Longtime Disney collaborator Gilkyson was the first songwriter to complete several songs which followed Kipling's book closely; however Walt Disney felt that the works were too dark. The only piece of Gilkyson's work which survived to the final film, was his very upbeat song The Bare Necessities. The Sherman Brothers were then brought in to do a complete rewrite. Disney frequently brought the composers to the storyline sessions, and asked them to "find scary places and write fun songs" that fit into the story and advanced the plot. The popular success of the film in undoubtedly due to both the music and songs, that were primarily written by the Sherman Brothers. Wolfgang Reitherman began working for Walt Disney in 1934, along with future Disney legends Ward Kimball and Milt Kahl. Reitherman worked on various Disney feature films produced from 1937 to 1981, including "Snow White and the Seven Dwarfs" (animating the Slave in the Magic Mirror) up to "The Fox and the Hound, " where he was the co-producer. Beginning with 1961's "One Hundred and One Dalmatians, " "Woolie", as he was called by friends, served as Disney's chief animation director. In addition to "101 Dalmatians, " Reitherman directed "The Sword in the Stone" (1963), "The Jungle Book" (1967), "The Aristocats" (1970), "Robin Hood" (1973) and "The Rescuers" (1977). One of Reitherman's productions, the 1968 short "Winnie the Pooh and the Blustery Day, " won the Academy Award for Best Animated Short Film. In addition, all three of Reitherman's sons Bruce, Richard, and Robert provided voices for Disney characters, including Mowgli in "The Jungle Book, " Christopher Robin in "Winnie the Pooh and the Honey Tree, " and Wart in The Sword in the Stone. " Not only did Bruce Reitherman provided the voice of Mowgli in "The Jungle Book, but he also acted out certain scenes as live action reference for the animators. The character of Mowgli was animated by quite a few animators, however Milt Kahl set the final design and the majority of Mowgli's scenes were animated by Frank Thomas and Ollie Johnston. King Louie is the king of all primates in the Indian jungle and craves nothing more than to be a man. He somehow learns that a Man-Cub (Mowgli) is in the jungle on his way to the Man Village. Louie sends his monkey minions to capture the boy, which they do bringing him to King Louie. Using the musical number "I Wanna Be Like You" and promising Mowgli that he will be able to stay in the jungle for as long as he wants; Louie asks him to reveal the secret to man's "Red Flower" (fire). This cel is from one of the most famous scenes in "The Jungle Book" film; King Louie (voiced by Louis Prima) singing I Wanna Be Like You! King Louie is an original character from Walt Disney, as orangutans are not native to India (only the islands of Borneo and Sumatra in Indonesia). In addition, King Louie never existed in Rudyard Kipling's original novel and was likely named after his late voice actor, jazz singer Louis Prima. Before Louis Prima got the part, the iconic musician legend Louis Armstrong was first considered for the role. However, Prima got the role instead of Armstrong; possibly to avoid controversy that would surround casting an African American as an ape. 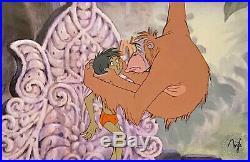 This is one of the finest cels of Mowgli (The Man-Cub) and King Louie that I have ever seen! Both characters are eyes open and they are in a dynamic and action filled pose from the I Wanna Be Like You! This cel is from the beginning of the song when King Louie says I wanna be a man, mancub. And stroll right into town. And be just like the other men. I'm tired of monkeyin' around! A large and impressive image and a great addition to any Walt Disney animation art collection! Measurements: Size - King Louie & Mowgli: 8 x 7 1/4", Image 9 1/2 x 14". 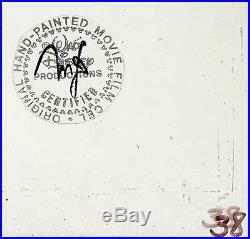 Condition: See pictures of the actual cel, which is in excellent overall condition as shown by the pictures above! All items we sell are from a smoke-free/mold-free home/workplace and are in excellent condition unless otherwise noted. I own every work pictured for sale and I stand behind every item. Please follow/bookmark me as a favorite and keep and keep checking back for more items for sale in the coming weeks. For now, please check out my other Drawings and Cels and other original modern and contemporary artwork for sale! 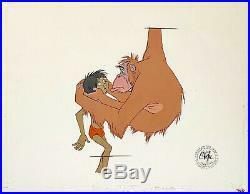 The item "1967 RARE DISNEY JUNGLE BOOK KING LOUIE MOWGLI ORIGINAL PRODUCTION ANIMATION CEL" is in sale since Monday, March 25, 2019. This item is in the category "Collectibles\Animation Art & Characters\Animation Art\Production Art". The seller is "shadowline" and is located in Durham, North Carolina. This item can be shipped worldwide.